Professor Ada Yonath, Weizmann Institute of Science, Israel. To facilitate instant recovery of active life once bears wake up from their winter sleep, nature provides ingenious mechanism based on periodic packing of their ribosomes, the cellular machines that translate the genomic instructions into proteins. This mechanism inspired crystallization of bacterial ribosomes, thus producing the samples which eventually yielded the stunning ribosomes’ molecular structure. Owing to their fundamental role in life cycle, ribosomes are targeted by many antibiotics. 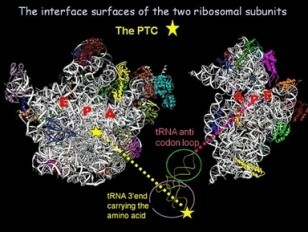 The structures of these antibiotics in complex with ribosomes revealed their modes of action, shed light on strategies used to differentiate ribosomes of the pathogens from those of patients, provided insights into mechanisms acquiring resistance to antibiotics, and elucidated structural bases for the design of more potent antibiotics. Professor Ada Yonath is the Kimmel Professor of Structural Biology at Weizmann Institute of Science, Israel, and the Director of the Kimmelman Center for Biomolecular Structure and Assembly. She was awarded the 2009 Nobel Prize for Chemistry for her work on the structure and function of the ribosome.